What can a 17 year old teach us about building an author platform? A LOT! 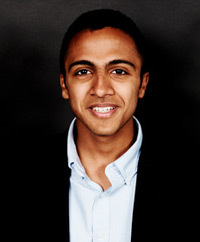 Today I want to profile Nikhil Goyal, a 17 year old high school student who will be releasing his book on education reform this September: One Size Does Not Fit All: A Student’s Assessment of School. I met Nikhil back at the Writers Digest Conference in January, and was immediately impressed with him. When In the months that followed, I was floored by how professional he was and how quickly he is growing his platform. Recently, he and I chatted about the exact ways he has grown his following and built his credentials, which include mentions in The New York Times, Wall Street Journal, NBC, Fox Business, and others. He has also spoken at more than a dozen events and conferences this year. He has more than 13,500 followers on Twitter, and amassed this following by discussing series issues in education reform in an intelligent manner. “The way to build your brand and get people to notice you is to post intellectual things and controversial things, provoking a dialogue.” This is how Nikhil describes his process for the past year and a half. The thing that stumped me on the face of this is: there are thousands upon thousands of 17 (and 18 and 16 and 15, etc) year olds out there who are students, whose voice should be heard. Why does anyone care about his voice in a broader sense – why is The New York Times and Wall Street Journal and major conferences getting his viewpoint on education reform? What is his credibility? He told me how the writing, research, and building an audience for his book provided him a reason to interview people and engage with those active in this field. But it went beyond that. People were interested in a student giving ideas because oftentimes you don’t think of high schoolers engaged in social media in a productive manner. “Age can get you only so far. Your ideas have to be solid, backed by evidence; you have to talk to experts. I engaged with some of the most important people in education,” he told me. Nikhil and I met at the Writers Digest Conference in January. He attended my session, and came up to me after to introduce himself. This is something I always recommend people do at conferences, but only a small percentage of attendees do. This is how you differentiate yourself, make valuable connections, and turn generalized tips into personalized advice from the speakers. Nikhil was well dressed, gave me his business card, and told me about his book. He was well spoken and brief, being respectful of my time. I know, this seems like a simple thing, but most adults don’t want to wait on a line to chat with a speaker, and freeze in that moment when it’s there “turn” to describe what they are about. So they find excuses to not do it. Nikhil took that risk. From there, he followed up with me via email again and again, and now here I am featuring him on my blog. Risk = reward. But what really impressed me when we met was this: I told him about an event a week later, Columbia Journalism School was having a “Social Media Weekend” event, and I recommended he attend it. Sure enough, a week later I saw him there. That made me realize how serious he was. He describes his process of reaching out to others for his book:”I just started researching and spoke to all different kinds of people on all different sides.” He told me how he spoke to authors of books on education reform, those featured in articles about the topic, and the journalists who wrote them. This is a huge differentiator for him. 99% of people who want to do what Nikhil does, won’t. Essentially, he is cold calling people. He is forcing himself to be uncomfortable to try to get folks to return an email, do an interview or get on the phone. Most adults step cautiously, as if they have everything to lose. But Nikhil only seems to see what he has to gain. I’m sorry, but a lot adults spend there whole life trying to get over rejection they felt in high school. Here is someone who doesn’t worry about rejection. That’s rare, and another way that he will find ways to succeed when others just find obstacles. His website and photos of himself are professional – and what he shares on his blog or social media is strongly focused on the same topics. When you see him anywhere, you quickly know exactly what he is about. You know his brand. Nikhil only started going to events in late 2011, and he used social media just “for fun” before that as well. Then he began speaking, and it snowballed from there. He has 13,500 followers, but he has only focused on Twitter in the past year and a half. How did he get so many followers so quickly? Education chats – those weekly hashtag chats on Twitter. Evidently, there are 10-15 chats per week: #EdChat, #StudentVoice chat, #SSchat (reforming curriculum in social studies), etc. So he participates and gets his name out there in a place where very few students are. Oh, also this… to the right is a screenshot of his Twitter feed from last night, where he takes the time to thank individual people who shared an article that featured him. How does he find the time? During the school year, he does a lot of article writing during class, finishes homework during class so he doesn’t have to do much after school. He Tweets during school, pulls up The New York Times on his Kindle and Tweets out interesting articles he’s read. After school and weekends, he devotes his time to the book, which includes lots of interviews. Again and again, you see that Nikhil focused on the basics: knowing his audience and engaging with them in a meaningful manner. A lot of people have this viewpoint that someone who is 17 that is a “digital native” and grew up on social media lives in some kind of new world of social engagement; that it’s all about texting and Tweeting and Pinning. But Nikhil has leveraged email, knowing how to present himself, his intelligence, and just plain showing up at in-person events and talking to people. The other day, I had someone pressing me to find a “secret button” (my word, not theirs) in social sites such as Twitter or LinkedIn or Facebook that allowed them to essentially blast their message to not just their followers/connections, but to those people’s friends and followers. They wanted to scale without any effort, at the push of a button. There is this impression that is what social media has given us, but that is inaccurate. The basics still matter, and seeing what Nikhil has created in such as short period of time illlustrates this. And here is his recent appearance on Fox Business. To hear my chat with Nikhil, click ‘play’ below.